Woohoo~ I had lots of fun today since I met up with jolenesiah and an ex-classmate which she was named "S". I treated them to a movie called Hairspray as my post-birthday present. Yes I know... they should be giving me presents but hehe .. according to Chinese traditions the birthday person is supposed to treat people. Haha.. never mind la since I also just got my salary which will be depleted soon after I pay off my debt to my mum. Haha. The movie was good. I had lots of laugh though the plot was simple. One fat girl made changes to the entertainment industry and championed for integration of the white and black. Simple, short and sweet. Later ... we went to the Garden... the new high end mall like Starhill. Wow. It exudes the smell of "brand new" and we shall see how long does this brand new feeling could last. We got so many buildings that are called malls in Kuala Lumpur one by one they are becoming useless and ending up as slums... places no longer people want to visit anymore. How sad it is. Once this happens, we never say "Hey we should fix this problem before moving on" but we often say "Hey let's build a new mall since we got so much land to develop... why bother fixing the old ones?" I managed to get a jeans for RM 39.00 from a high end place. Not a bad price! We had Indian food for dinner. I would love to eat more but I was sick so I just had one round with second round of dessert. Haha. I love their bread pudding. It was so good! Each of us paid RM 10 because it's for charity purposes. And it was funny that we were one of the first diners to be there and we yakked until 8.30 pm. We were there for like 1.5 hours. Just sit there and chat. S was sharing with us her naughty yet intriguing experiences on snorkelling/ diving in Malaysia. Pretty scary when she said she met sharks and being drifted away by the current. To end our fun day... we took photos. I will only post one here. The rest, see jolenesiah's blog. I was on sick leave from work today. I thought I would b creating a free sick month but unfortunately I was not determined enough because I got throat infection and flu and you name it. How do you know you got throat infection? Easy ... if you have ever feel your throat is itchy and you just feel like scratching it with your tongue, it is an indication of a virus work in your throat. How I know? The doctor told my mum. In fact my whole family gets on with our doctors pretty well so we get to extract tonnes of information like how they met their wife... what do they download during their free time except all of them don't want to give me sells. Haha. Getting to know I have throat infection for the past few days is really bad already but the doctor today really gave me a second heart attack after my first one from reading Naruto chap. 371 at 8.30 am. I learnt my lesson not to read manga in the morning. The second diagnose I have is I'm likely to have goiter. My eyes nearly popped. he was massaging my thyroid area and he asked me why is my thyroid swelling. It's abnormal. I was shocked. He said it wasn't normal unless I'm having some hormones discrepancy. Worse come to worse is I would be on long term medication because it's also a hereditary illness. I was simply dazzled by the word "hereditary". My mum was screwing her head to remember which family of hers has thyroid problems other than dying from all kinds of cancer. Yes... my family has a string of death due to cancer. I was listening to my aunt and mum saying this and that aunt died of dunno dunno what cancer. Pretty scary. Doctor said I need to take a blood test soon because the last time he saw his patient who has the same problem as me ... her eyes were potruding. I said "Wow.. her eyes pop out?" Doctor replied "Yea popped out and cannot masuk balik." I GASPED with my eyes potruded! 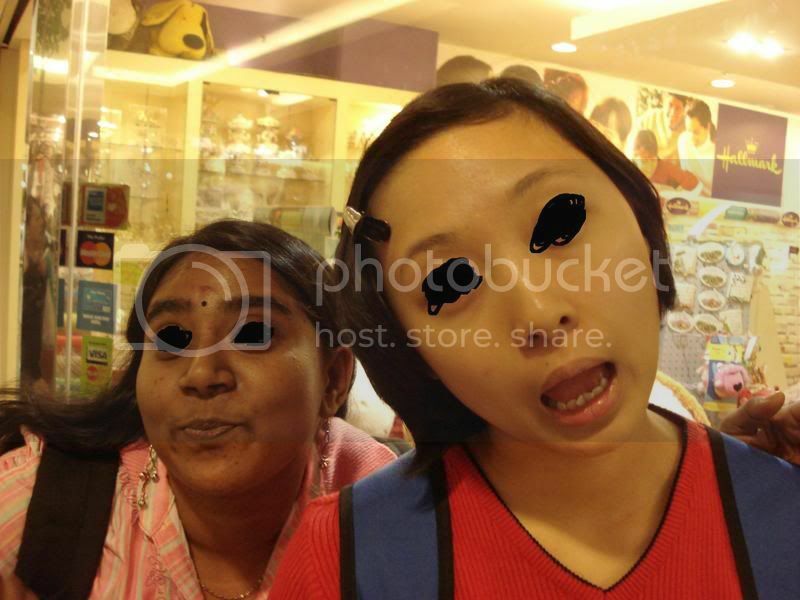 So now this patient would undergoing surgery to fix her eyes soon. I was speechless. Why do I have so many illnesses? Next month ... I'm going to see another specialist for different health illness. That is also a very serious problem. The last time I had stomach discomfort, I had needed a jab to ease the pain. Doctor advised me to see a specialist soon. OMG. I want to be strong and healthy... I want to live longer to achieve every dream I have. And who the hell said "Take things slowly?" It is too short to be ordinary for GOD SAKE. Stop telling me "You so young take your time to do things"!!! Tithe: A Modern Faerie Tale. A review. Sixteen-year-old Kaye is a modern nomad. Fierce and independent, she travels from city to city with her mother’s rock band, until an ominous attack forces them back to her childhood home. They’re still there. But Kaye’s not a child any more. This time she’s dragged into the thick of their dangerous, frightening world. A realm where black horses dwell beneath the sea, desperate to drown you… where the sinister Thistlewitch divines dark futures… and where dashing Faerie knights are driven to perform acts of brutal depravity for the love of their uncaring queens. If you are an avid reader of my blog, you must have seen through me that I have a fetish for supernatural beings, regardless I like it or not. So I’m not surprise seeing myself picking up this book. In fact, I have read a lot of books on fantasy and always hungry for romance books except for pure romance stories where lovers roll from the bed to some lake. But to be honest with you guys, I actually bought this book on impulse. I was in this bookstore to collect my birthday voucher but cannot!!! I have to collect it within seven days after my birthday. How dumb is that? And I was there 3 days before my birthday. So determined to get something before I leave, I randomly pick a book from the fantasy shelf. Oh… don’t worry this is not my first time doing so. As usual, I was attracted to the cover because it exudes some gothy feelings with this sort of dead preserved butterfly or moth on the cover. It feels good in my hand too. Yes I know I’m very shallow. To show I’m not that easy to be cheated, I got this book also because it was a nominee for a Mythopoeic Award. No idea what award is that. I like how Black spins the story. From the first page you read until the end, it is a flow of logic and short and sweet descriptions about the main characters and the events. Rich enough for you to drift into fantasy. The main characters are - I have to admit they are nothing new – fey creatures. Of course, you don’t expect to see an alien with two big bulging blue eyes and greet you “I come in peace from Uranus” in a fantasy realm, right? The male protagonist is a knight elf, Roiben, who works for the bad queen and main female is a pixie, Kaye, clad in human glamour. Kaye is a kind of a girl that some people might term weird because she could see fey. No one believes her. What’s more is she didn’t see any more fey when she was nomad-ing in the bigger city, where she console herself she has lost her innocence. As a school drop out, she works in a Chinese restaurant to support her mum and involves in activities a normal teen would venture – smoking and drinking. I feel Black has successfully captured the lifestyle of a teen like Kaye and also her feelings and mindset of every event flows in the story including the scene of her falling in love with Roiben. Oh well, which girl doesn’t fall in love with a handsome gorgeous elf even if he’s just a gardener? The way Black writes about Roiben could make me imagine how he looks and I didn’t drool over him. Gosh… Who ever said that? But you can see that Black emphasizes more on Kaye’s characteristics and personality than Roiben. So Roiben’s past is still a shrouded mystery to the readers. One thing I’m a little confused with Roiben is of a page. Black explains that Roiben keeps on recalling how he threw Kaye to the floor and freezes the reaction image of her face over and over again. And then he kisses her when he met her the next time. Ha? You fall in love with a girl with a shocking expression? What an uncommon way to fall in love. But my point is … thinking back of that image doesn’t mean it is love or rather he’s simply confused over why Kaye has that expression? Usually people reminisce over something because we don’t understand that something. Could that something give birth to love? I need to forward this question to Black. When you discovered Roiben also likes Kaye… you would surely go “OMG OMG” especially fans of gorgeous supernatural beings. How did it end? Did they manage to get together? Woah … calm down girls. The ending gives you a 100% satisfaction so no fretting over this weird couple. Overall, this is an enjoyable Young Adults fiction that I don’t mind reading it for the second time. Warning: there’s part two. In my blog, I said I would spit out my theory on why Black didn’t win the award. Let me iterate this. This is just my theory. I have read a few winning award books before especially YA. The common trait of all those story winners is you get a lesson out of the story. A lesson that makes you think back of your life or leaves some very not comprehendible impression and also makes you to apply critical thinking. For this story, it is just another happy-ending fey story. All well ends well. The nightmare I had didn't affect my sleep the next night. In fact I dreamed of something nice but I guess that will freak you guys again. Hang on, don't go away first before I finish my sentence: there's nothing horrifying in this blog. Just sweetness. Trust me. I don't know why these few nights recently I have been freezing at night. I keep on rubbing my temple on my small square pillow next to my shoulder. I would hug it and rub my temple into the pillow every mid morning. As I said I have been freezing recently not only by the chillness in my room but also by my wall fan right at my toes. The wind is icy cold when it lands on my face so I guess that's why I rest my temple on the pillow. But this night I was so freaking cold I unconsciously covered my whole head with the blanket. And I slept. In my unconsciousness/ sub-conscious, someone actually remove the blanket from my face and made sure the blanket covered my head and cheek so I still could breathe easily. Haha but unfortunately the blanket was still covering my head when I woke up! Hope you guys will have a sweet dream after reading my blog entry. I had this weird weird and quite eerie dream this morning. It all happened when I was imagining what my friend who just came back from Africa would tell me about her volunteering work. I'm expecting to see pictures taken by her and I don't know somehow why I keep on picturing where this picture of her would have some bodiless skulls beside her. Not one but 5!! And the reaction I had in my imagination is running away from it and hiding a corner in the office. Freaky? Then I thought "Wow, renaye has got some new inspiration to write some horror story." Sounds good? I woke up in the middle of the night to go to the toilet. As I walked to the toilet, I felt something not right. My inner self kept on asking me to turn on my room light before I go to the toilet. And of course I turned on the toilet light. The feeling of not right still hung with me as I walked back to my room. I didn't turn on my room light because I thought I was just being a scaredy-cat and thinking too much. I went back to sleep. Actually I still feel something wrong! And I just told myself to go to sleep and then I drifted into a dream. It was haphazard (which dream is not?). I was walking in a school with rows of classes where all primary students were working in their exercises book. I continue walking on and I think I went to the second floor. I think I was wearing jeans with a blue or pink top. Continue walking and then I saw my Malay language teacher from high school asking me what was I doing here. I replied I got no classes today. He looked weird in the dream because of the hair-do. Weird hair-do. And then I wanted to shower in the toilet. Don't know what toilet. There was a shower room but I can't go in. It was not locked but blocked and I could just peep a little. A white door was blocking it. So I ended up showering in a toilet unit. Later, I was on a rooftop. Not the kind of rooftop where it is designed to hang your clothes whatsoever. I was just standing on the rooftop looking at row of houses. Jolenesiah was with me. We were looking together and she pointed to me a house. Her house. I looked left and right. And suddenly, we were travelled back to time. The time before other houses than jolenesiah were built. The land was tarred. And on my right was a Maze garden... Jolenesiah and I were trying to get a picture of the scene. So she got a digi-cam to take it and I was nagging her for her inaccuracy. Of course. She wasn't looking where she was taking! Then we climbed off the roof. This is where the freaky part comes in. Damn ... my sister woke me up because I woke up 10 minutes late. The picture's ambience was eerie. And looking at the 'me' wrapped in the shawl was ever scarier. Oh well, I can't the 'me' very well but someone inside me told me it was 'me'! And how possible for that 'me' to be me when I'm so tomboyish? Recalling this dream now really really sends the chill to my spine. I really hope my friend who just got back from Africa didn't attract any unwanted visitors. I just finished a romance, adventure book called Tithe by Holly Black. It was a short-listed award candidate and by finishing it I know why it was not a winner. I would explain my theory when I do a review on this book. Yes I am going to do a review. But that would be after me finish reading another adventure but forbidden romance book called Wicked Lovely by Melissa Marr. I forgotten to get a soft cover instead of hard one since it would be cheaper but I have discovered the joy of holding a hard cover book again. I thought it was lost. I'm now reading 2 books: Be Mine by Laura Something and Wicked Lovely by Melissa Marr. Both of them are equally good. And I'm clearly paying the price for reading 2 interesting books at a time. I feel like I want to read both of them at the same time. I could if I knew Kage Bunshin Jutsu (Dopplehanger). Gee. Speaking of which to read first, I'm now watching Engineering Empire: Egypt. Very damn interesting to see how the Egypt people build the pyramid without any machines other than 2 hands. I think it's a genius work because I simply don't have a brain that works like that. But I'm also torn between tonight's programme because I also want to watch Scary Movie 4 which starts the second hour of the programme I'm watching now.